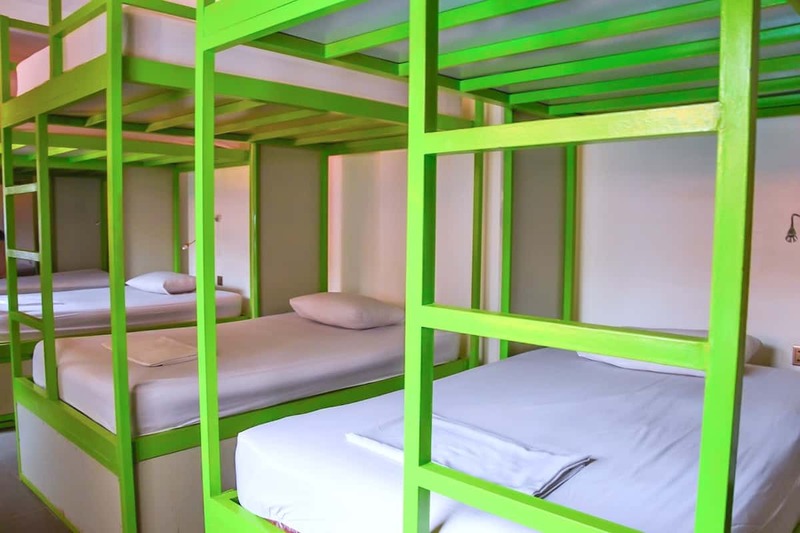 Are you looking for the best Female-Only Dorm Room and shared accommodation you can find in Siem Reap? 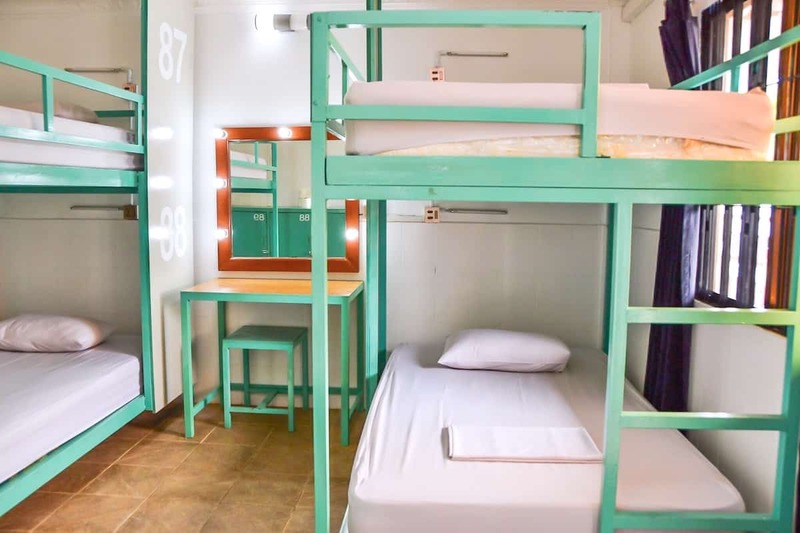 Mad Monkey Hostel is located just a stone’s throw from Pub Street, a short drive from the Angkor Wat temples and other attractions in Siem Reap. Judging by reviews from our awesome guests, we offer a perfect balance of fun social atmosphere and safe, secure environment – just what you need when you’re backpacking. 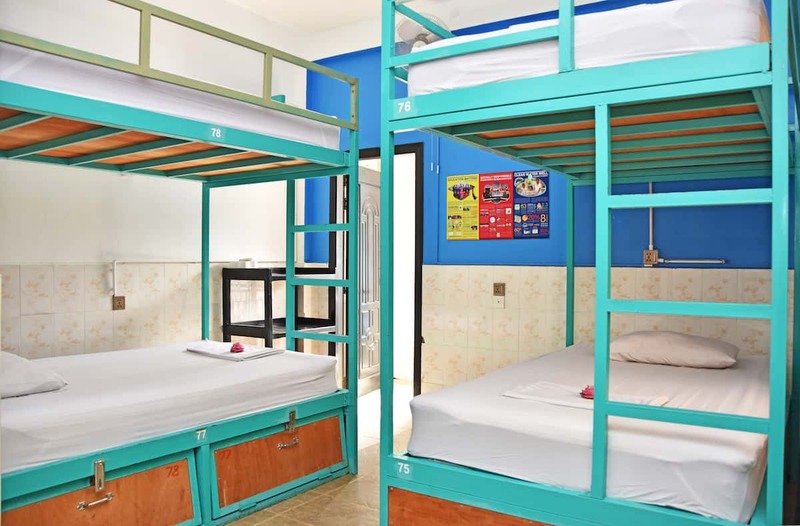 Our dorm rooms are the most comfortable to be found in Siem Reap. Each dorm room has air conditioning and wall fans to keep you cool. All of our beds are massive, with oversized 1.2 metre mattresses. 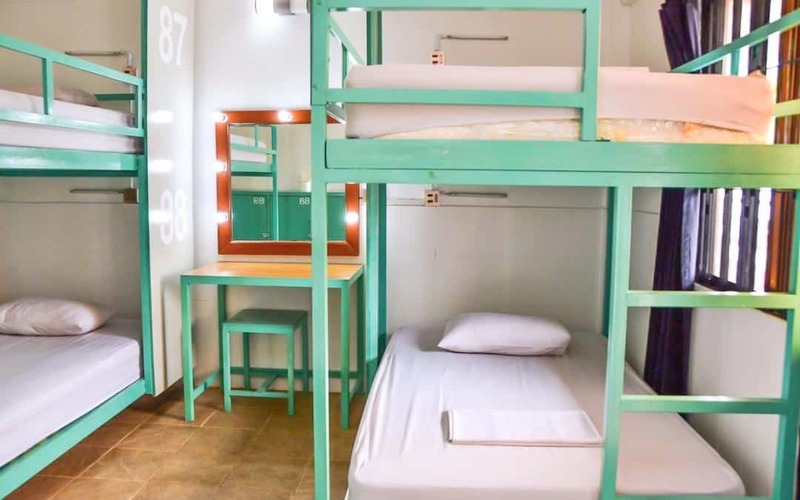 Each bed has its own reading light, secure luggage storage (requires a padlock – sold at reception if you don’t have one), and its own power outlet for your electronics. 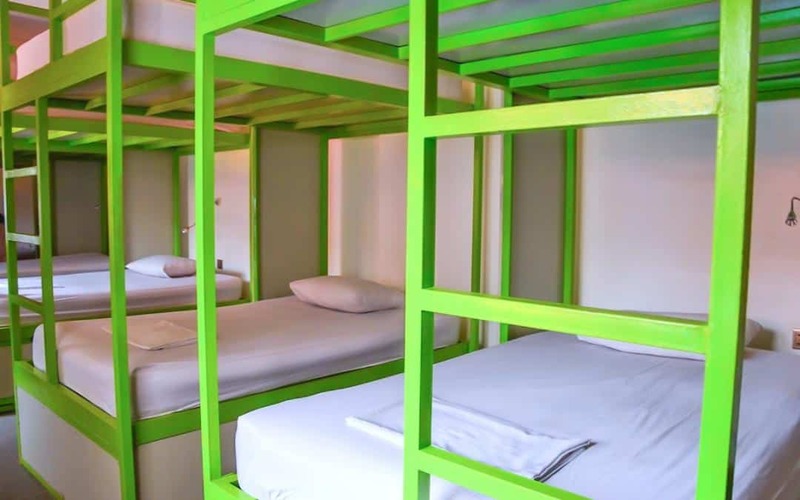 If you are looking for an awesome hostel with great dorms in Siem Reap, Mad Monkey is the place for you. Book direct online here for the best rates. Book early to avoid disappointment, our rooms tend to sell out and we want to see you here…! The room can be subject to some noise until our bar closes at midnight. The main doors to our dorm rooms do not lock because of the logistics of guests coming and going. Instead, you have a secure locker within the room where you can keep your valuables locked away. Splish splash! What’s that now? Only the sound of poolside luxury at dorm room prices! These dorms are adjacent to our large swimming pool and buzzing poolside bar. You’ll be right in the heart of the fun all day long. If you ever drag yourself out of the pool, you’ll find that the room is air conditioned and has a wall fan, so you’ll be as cool as cool can be. It also has an en suite bathroom with a hot shower. There’s plenty of storage space for everyone’s belongings, and an overall airy and bright vibe. Personally in your bunk, you’ll have an individual reading light and a power outlet for all your charging needs. You also get your own secure locker for you bags and valuables – just be sure to lock it up (we sell padlocks at Reception if you forgot yours). Book direct online here for the best rates. It’s so key to book ahead – we tend to fill up way in advance, especially for sought-after room types like this one. We’re hoping to see you here soon, so save yourself the hassle down the road and just get ‘er booked now! We hear you, backpackers: you’re on a dorm budget, but sometimes you just aren’t down for the big dorm lifestyle. You’re fine with a bunk bed, but does it have to come with a gazillion roommates? No, no it doesn’t. Our 4 Bed Dorm is the dorm you’ve been waiting for. Share your space with 3 other bunkies in a cozy but airy room that meets all your needs. The dorm is air conditioned, and there’s also a wall fan for extra cooling power. You and the roomies have your own en suite bathroom with a hot shower (no long lines!). There’s plenty of storage space for everyone’s stuff. We also haven’t skimped on your personal space. You’ll have an individual reading light and power outlet in your bunk. You also get your own secure locker for your bag and valuables – just be sure to lock it up (we sell padlocks at Reception if you don’t have your own). Book direct online here for the best rates. Now, don’t put this off. We tend to be at least 95% full on any given day and we can rarely take walk-in reservations. We’re looking forward to seeing you here, so don’t leave it to chance. If you’re looking for a clean and comfortable dorm room, then you’ve come to the right place friend. 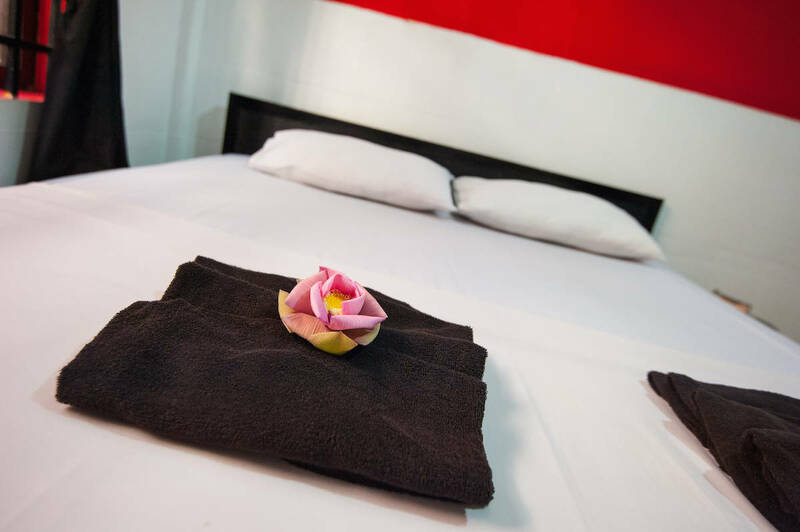 Our 8 Bed Dorms offer everything you need for a memorable stay in Siem Reap. The perfect home base for temple exploring, tarantula tasting, tequila toasting, or all of the above. The dorm itself is large and bright. The room is air conditioned, plus there are wall fans to keep you extra breezy and cool. The 8 of you will share an en suite bathroom with hot running water, so you’ll be fresh and clean your whole stay long. While you will have 7 new friends to bunk with, you’ll still have lots of personal space. Our famously oversized bunks are great to curl up in, with 1.2 metre-wide mattresses and soft bedding. You’ll also enjoy a personal reading light and power outlet. Down below, you’ve got your own secure locker for your belongings and valuables (you’ll need a padlock, but we sell them at Reception if you happened to forget). Book direct online here for the best rates. Be smart, book ahead. We are almost always sold out, so we usually can’t take walk-ins, and it would be a bummer to not get to show you the Mad Monkey experience. You know the saying: two’s company, three’s a crowd… and twelve is a party! Book in our largest dorm room to meet lots of people (and skim a little off the price of your bed – we’ve all got a budget). This room may hold a guests, but it’s spacious. In your bunk you’ll have a massive, comfy mattress with its own reading light and power outlet for all your charging needs. You’ll also have a secure locker for your bag and valuables (padlock required – we sell them at Reception if you forgot). The dorm has an en suite bathroom with hot showers. It’s also air conditioned (plus there are wall fans for bonus cooling). It’s all the comfort you need in a dorm, without any of the frills you don’t want to pay extra for. 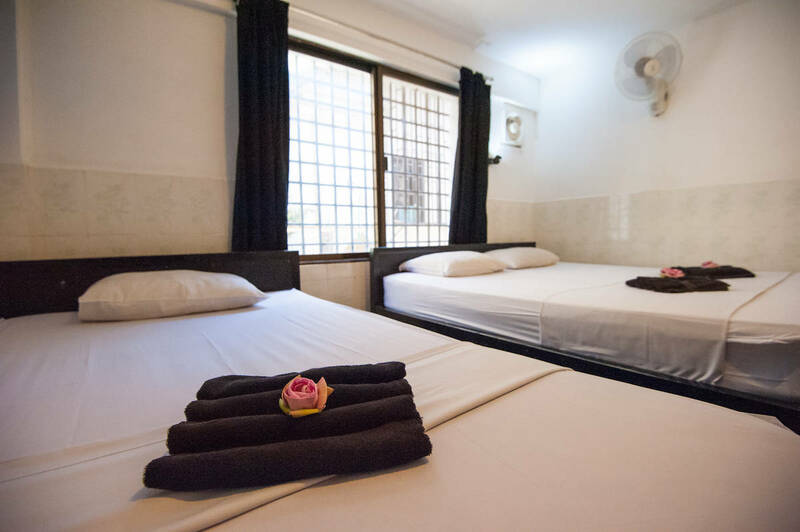 If you’re looking for a comfortable room for 2 in the heart of Temple Town, the search is over. Our Twin Deluxe room sleeps 2 guests in 2 single beds – everyone gets their own space. The two of you will have your very own en suite bathroom, complete with a hot shower (so key after a dusty day of temple touring). 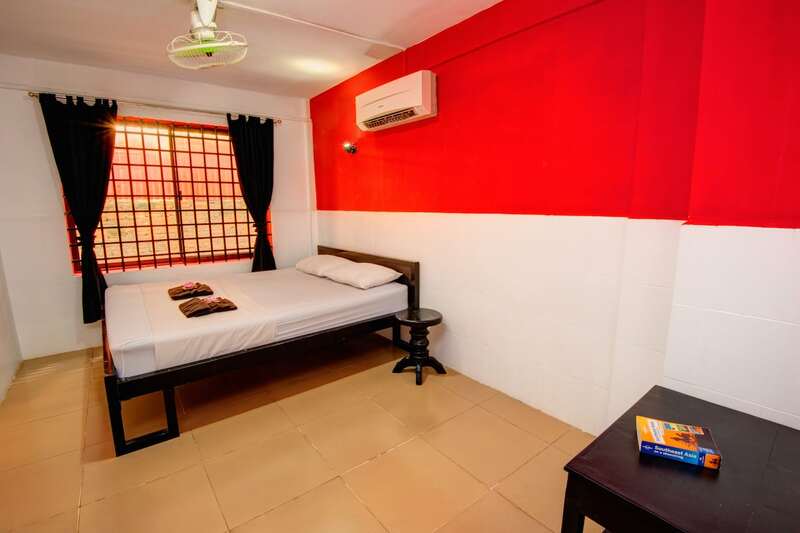 There room is equipped with both air conditioning and a wall fan to keep you breezy and cool. There’s no TV to be found in here, but there are awesome events on every night in our rooftop bar, as well as all of Siem Reap to explore just outside your door. So, we think you’ll be just fine. Book direct online here for the best rates. We really recommend booking ahead, we’re usually too full to take walk-ins and we wanna hang out! Sleeps 3 in a lovely poolside location. This room is right in the heart of the action, facing the large swimming pool and our lively poolside bar. You’re steps away from a refreshing dip or a refreshing drink. 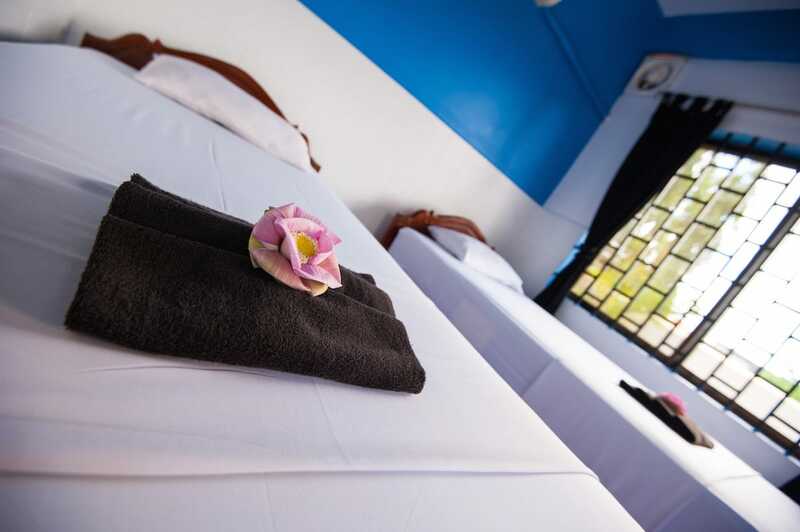 Your crew will have a double bed and a single bed at your disposal, as well as an en suite bathroom. That bathroom has a hot shower for rinsing off after your pool sessions. In your brightly decorated room you’ll enjoy air conditioning and a fan to keep you cool all day and all night. There’s plenty of storage space for your things, and the room locks to keep your stuff secure. There’s no TV, just lots of fun to be had right outside the door. This vibrant room sleeps 3 guests in a double bed and a single bed. It’s the perfect place to kick back after a long day of Tomb Raider-style temple exploring, or a long night out on the town. Air conditioning and a wall fan will keep you cool as a cucumber, and your en suite bathroom includes a hot shower when you need to heat things up. While there’s no TV in the room, there is nothing but good times waiting for you out in the rest of the hostel. This room comes with the added bonus of 100+ cool people to meet – all your fellow Mad Monkey guests. This Double Deluxurious room sleeps 2 guests in a double bed. The room has everything a backpacker’s heart could desire: air conditioning, a wall fan, an en suite bathroom (no shower line ups! ), and hot running water. There’s also plenty of space to store your stuff. What do we offer in the way of entertainment? Not a TV in your room, sorry folks. Just an ever-changing array of awesome events and parties with a cast of 100+ backpackers from around the world. Book direct online here for the best rates. It’s a mistake not to book ahead. We have an average occupancy of 95% and we usually can’t take walk-in bookings. So the budget is tight… we’ve all been there. Saving a few dollars shouldn’t cost you a lot of comfort, though! Can we tempt you instead with our Mad Monkey Budget Double Room? This financially responsible crash pad sleeps 2 guests in a double bed. You’ll have your own en suite bathroom with a hot shower. Not bad for budget, right? The only catch is that the room has a wall fan, but no air conditioning. But you do also have access to our large swimming pool, so you should have no problem beating the heat. 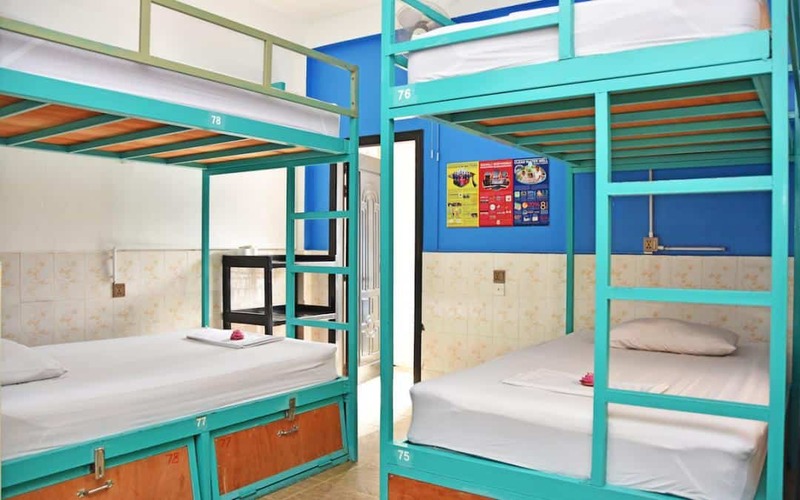 There’s no TV in this room, but there is a world of fun to be had in this hostel. Join us up in the rooftop bar for nightly special events and unforgettable parties. Book direct online here for the best rates. We really, really recommend making an advance booking – we fill up at least a week ahead most of the time, and it would be a shame not to get to hang with you.